To celebrate the history of Black Canadians, we’ve selected a group of NFB films that portray the multi-layered lived experience of Canada’s diverse Black communities. The incredible stories of strength, courage and perseverance in the face of adversity that these films present are not often found in mainstream history books. Black communities and cultures have been part of Canadian history from its earliest days, but sadly, their contributions and the lessons they can teach are rarely studied at the elementary or secondary level in schools. This selection can only scratch the surface of such a rich social record, but the films included span the country and explore a wealth of topics. Black Soul (2001) by the acclaimed Haitian-Canadian animator Martine Chartrand provides a beautifully crafted overview of Black history and culture from its origins in Africa to the present day. In 1957, years before Hollywood tackled the subject of interracial marriage in Guess Who’s Coming to Dinner?, there was the NFB short drama Crossroads, set in Toronto. The documentary Golden Gloves follows the lives and training of amateur boxers in Montreal in 1961, including the Black boxer Ronald Jones. And Trinidadian-Canadian filmmaker Selwyn Jacob’s The Road Taken (1996) focuses on the Black sleeping-car porters who for decades worked and fought discrimination on Canada’s railways. In Halifax, high school students building self-esteem and fighting racism are the subject of Speak It! From the Heart of Black Nova Scotia (1992), directed by pioneering filmmaker and educator Sylvia Hamilton. And in Jennifer Holness and Sudz Sutherland’s 2000 Speakers for the Dead, efforts to restore a Black cemetery in rural Ontario open up deep racial wounds that no one wants to discuss. Charles Githinji’s The Magic Lion (2004) tells the tale of a young Kenyan boy who goes on a quest to save the life of his sick grandfather, while Joe, from 2002, offers a celebration of the life of the West Indian-born Seraphim “Joe” Fortes, a legendary lifeguard who saved over a hundred lives in the waters off Vancouver—and in doing so, changed attitudes among those who had not respected him because of his skin colour. The films in this playlist are some of the most important NFB portrayals of the Black experience and paint a picture of a thriving part of our society in constant evolution. This feature documentary presents a thoughtful and vivid portrait of a community facing imposed relocation. At the centre of the story is a remarkably astute and luminous 12-year-old black girl whose poignant observations about life, the soul, and the power of art give voice to those rarely heard in society. Unarmed Verses is a cinematic rendering of our universal need for self-expression and belonging. Director Mina Shum makes her foray into feature documentary by reopening the file on a watershed moment in Canadian race relations – the infamous Sir George Williams Riot. Over four decades after a group of Caribbean students accused their professor of racism, triggering an explosive student uprising, Shum locates the protagonists and listens as they set the record straight, trying to make peace with the past. Invisible City is a moving story of two boys from Regent Park crossing into adulthood – their mothers and mentors rooting for them to succeed; their environment and social pressures tempting them to make poor choices. Turning his camera on the often ignored inner city, Academy-award nominated director Hubert Davis sensitively depicts the disconnection of urban poverty and race from the mainstream. Hardwood is a personal journey by director Hubert Davis, the son of former Harlem Globetrotter Mel Davis, who explores how his father's decisions affected his life and those of his extended family. Elegantly structured into three chapters entitled "love," "recollection" and "redemption," Davis uses personal interviews, archival footage and home movies to delve into his father's past in the hope of finding a new direction for his own. At its core, Hardwood is about the power of redemption and the healing of the bonds between fathers and sons. In 1959, at just 19, Harry Jerome was Canada's most promising track and field star on his way to the Olympics in Rome. By 1962, after suffering a gruesome leg injury, there was every reason to think that his racing days were over. But Jerome was not just a champion on the track; he was doubly determined off it. And so began his climb to what his coach, Bill Bowerman, called "the greatest comeback in track and field history." Through years of unparalleled political turbulence, racial conflict and his own personal challenges, Harry Jerome kept his head down and ran, displaying strength of character and willful perseverance every bit as impressive as his record-setting athleticism. Filmmaker Charles Officer uses gorgeous monochrome imagery, impassioned interviews and astonishing archival footage to tell the runner's triumphant story, from his early days in North Vancouver, through his three Olympics and his unequalled streak of records, to his sudden and tragically premature death. Family, friends and teammates recall a man who forever changed the Canadian sports landscape and made an indelible mark upon the world. Compelling, surprising and urgently paced, Mighty Jerome will electrify sports fans, history buffs and all those with an appreciation for tales of courage and redemption. This animated short tells the story of Seraphim "Joe" Fortes, one of Vancouver's most beloved citizens. Born in the West Indies, Joe Fortes swam in English Bay for over than 30 years. A self-appointed lifeguard at first, he became so famous that the city of Vancouver finally rewarded him with a salary for doing what he loved best. He taught thousands of people to swim and saved over a hundred lives. Yet there were some who did not respect him because of his skin colour. Through his determination, kindness and love for children, Joe helped shift attitudes. This documentary pays tribute to a group of Canadians who took racism to court. They are Canada's unsung heroes in the fight for Black civil rights. Focusing on the 1930s to the 1950s, this film documents the struggle of 6 people who refused to accept inequality. Featured here, among others, are Viola Desmond, a woman who insisted on keeping her seat at the Roseland movie theatre in New Glasgow, Nova Scotia in 1946 rather than moving to the section normally reserved for the city's Black population, and Fred Christie, who took his case to the Supreme Court after being denied service at a Montreal tavern in 1936. These brave pioneers helped secure justice for all Canadians. Their stories deserve to be told. This animated film by Martine Chartrand (Black Soul) recounts the friendship between a young Félix Leclerc and Frank Randolph Macpherson, a Jamaican chemical engineer and university graduate who worked for a pulp and paper company. An inveterate jazz fan, Macpherson inspired Leclerc, who wrote a song about the log drives and entitled it “MacPherson” in honour of his friend. Paint-on-glass animation shot with a 35mm camera. The Colour of Beauty is a shocking short documentary that examines racism in the fashion industry. Is a black model less attractive to designers, casting directors and consumers? What is the colour of beauty? This film is part of the Work For All series, produced by the National Film Board of Canada, with the participation of Human Resources and Skills Development Canada. This feature documentary takes us to the heart of the Jane-Finch "Corridor" in the early 1980s. Covering six square blocks in Toronto's North York, the area readily evokes images of vandalism, high-density subsidized housing, racial tension, despair and crime. By focusing on the lives of several of the residents, many of them black or members of other visible minorities, the film provides a powerful view of a community that, contrary to its popular image, is working towards a more positive future. This documentary tells the story of a young man’s struggle to balance his African traditions and new Canadian home. Arinze Eze was born in Canada and raised in Nigeria. An engineer by trade, he returned to his birthplace after 20 years. There, he starts a new career in the arts and falls in love with Canadian woman. All is well until his parents come for a visit. How will they react to this new life? This documentary features Black women active in politics as well as community, labour and feminist organizing. They share their insights and personal testimonies on the double legacy of racism and sexism, linking their personal struggles with the ongoing battle to end systemic discrimination and violence against women and people of colour. Martine Chartrand’s animated short dives into the heart of Black culture with an exhilarating trip though history. Watch as a young boy traces his roots through the stories his grandmother shares with him about the events that shaped their cultural heritage. In their predominantly white high school in Halifax, a group of black students face daily reminders of racism, ranging from abuse (racist graffiti on washroom walls), to exclusion (the omission of black history from textbooks). They work to establish a Cultural Awareness Youth Group, a vehicle for building pride and self-esteem through educational and cultural programs. With help from mentors, they discover the richness of their heritage and learn some of the ways they can begin to effect change. This 1996 documentary takes a nostalgic ride through history to present the experiences of Black sleeping-car porters who worked on Canada's railways from the early 1900s through the 1960s. There was a strong sense of pride among these men and they were well-respected by their community. Yet, harsh working conditions prevented them from being promoted to other railway jobs until finally, in 1955, porter Lee Williams took his fight to the union. Claiming discrimination under the Canada Fair Employment Act, the Blacks won their right to work in other areas. Interviews, archival footage and the music of noted jazz musician Joe Sealy (whose father was a porter) combine to portray a fascinating history that might otherwise have been forgotten. A classic NFB documentary about the Golden Gloves boxing tournament, the Canadian amateur's hope for success in the boxing world. This Gilles Groulx film shows three Montreal boxers in training. In behind-the-scenes interviews they talk about their ambitions and what prompted them to take up the sport. This sensitive drama tells the story of a couple, Roy and Judy, and the reactions they encounter when they announce their intention to marry, reactions complicated by the fact that Roy is black and Judy is white. 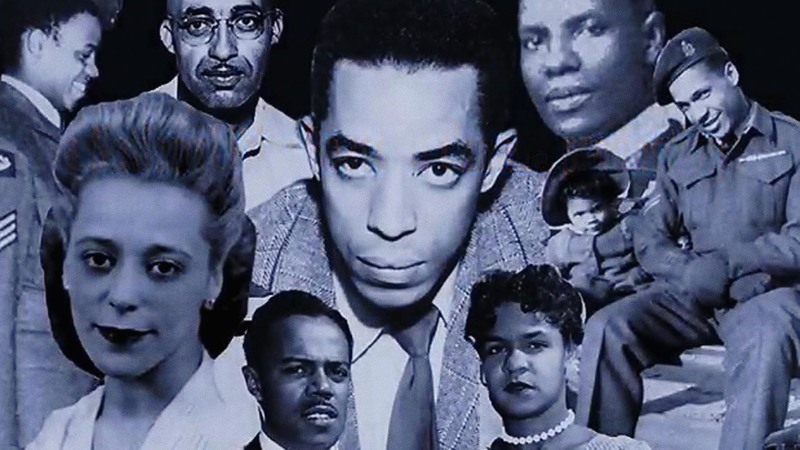 This documentary reveals some of the hidden history of Blacks in Canada. In the 1930s in rural Ontario, a farmer buried the tombstones of a Black cemetery to make way for a potato patch. In the 1980s, descendants of the original settlers, Black and White, came together to restore the cemetery, but there were hidden truths no one wanted to discuss. Deep racial wounds were opened. Scenes of the cemetery excavation, interviews with residents and re-enactments—including one of a baseball game where a broken headstone is used for home plate—add to the film's emotional intensity. This animated short is about a Kenyan boy who goes on a quest to save the life of his sick grandfather. In his search for healers in a mysterious village, he encounters a strange lion caught in a trap. Upon being freed, the lion gratefully takes the boy on an adventure. Black Mother Black Daughter explores the lives and experiences of black women in Nova Scotia, their contributions to the home, the church and the community and the strengths they pass on to their daughters. This short film depicts Africville, a small black settlement that lay within the city limits of Halifax, Nova Scotia. In the 1960s, the families there were uprooted and their homes demolished in the name of urban renewal and integration. More than 20 years later, the site of the community of Africville is a stark, under-utilized park. Former residents, their descendants and some of the decision-makers speak out and, with the help of archival photographs and films, tell the story of that painful relocation. This animated short for children tells the story of Christopher, a little boy who didn't want to be called Christopher anymore. Such a common name! When Aunty Gail from Trinidad tells him a story about a Tiger, Christopher changes his name to Tiger. But then he finds a better name. When he has trouble cashing a birthday cheque, he realizes maybe he should stick with his original name... or maybe not? Part of the Talespinners collection, which uses vibrant animation to bring popular children’s stories from a wide range of cultural communities to the screen. In a quest to rediscover the spiritual values of his own people, an African filmmaker from the Gourmantche tribe of Burkina Faso visits an Aboriginal band, the Atikamekw of northern Quebec. The resulting documentary is a dialogue between those who divine the future in the sand with those who use snow-encased sweat lodges to reconnect with the spiritual world. Monika Delmos's documentary captures a year in the life of two teenage refugees, Joyce and Sallieu, who have left their own countries to make a new life in Ontario. Joyce, 17, left the Democratic Republic of Congo to avoid being forced into prostitution by her family. Sallieu, 16, had witnessed the murder of his mother as a young boy in wartorn Sierra Leone. Delmos follows them as they bear the normal pressures of being a teenager while simultaneously undergoing the refugee application process. She shows how the guidance and support of a handful of people make a real difference in the day-to-day lives of these children.